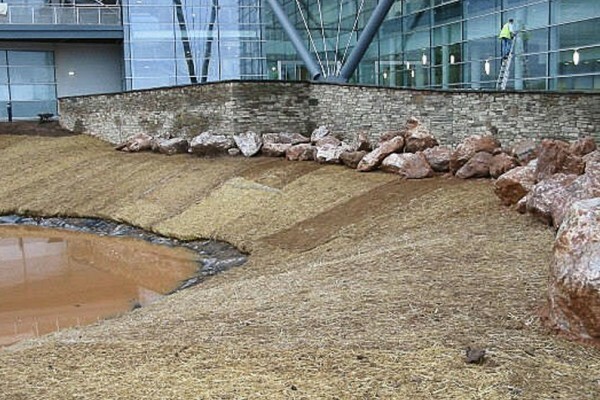 A wide range of erosion control mats are available on the market however these fall into two basic categories for most applications – those with a biodegradable element and those entirely made from a polymer that is designed to last longer. 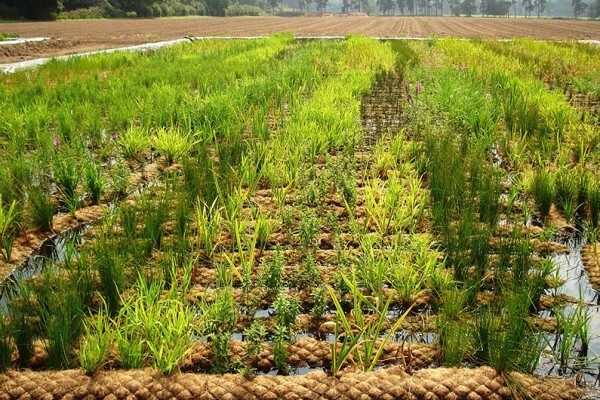 In reality, most erosion control mats are there to permit a cover of vegetation to be established and maintained. 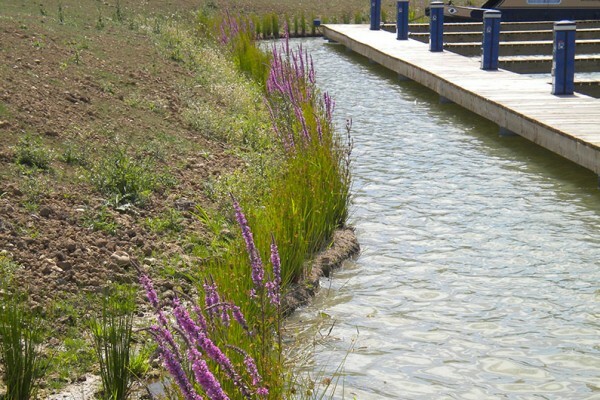 In the majority of cases, it is that vegetation which provides most of the beneficial effect with respect to erosion prevention. So when selecting an erosion control product we should be considering what we can encourage to grow there, how long it will take to establish and how we can maintain that growth through the seasons. 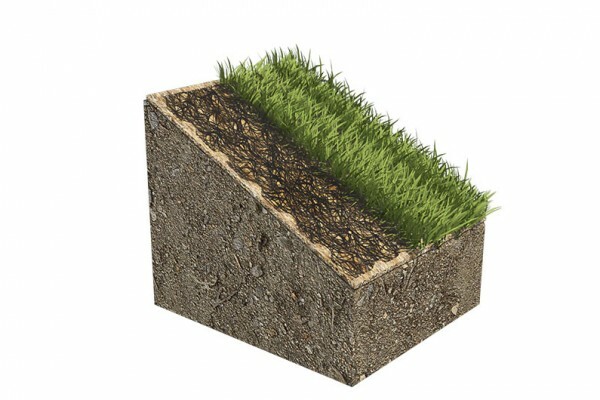 TCS offer a standard range of biodegradable erosion control mattings. The Techmat biodegradable range includes open weave jute and coir mats for short to mid-term cover (12 – 36 months) and denser blanket products consisting of 100% coir and 50/50 mix of straw and coir or 100% straw mixes. 350gsm, PP net (9mm x 9mm) Both Sides stitched with Brown PP thread. between a 9mm x 9mm Polypropylene (PP) netting. With PP thread used for the stitching. Techmat CB350(P9) is typically used on Slopes 1:1.5; 1:1 or steeper. Offering 100% soil coverage when laid in accordance with the installation guidelines, as opposed to the Techmat CN range of coir nets detailed below. The coir will break down over a period of time allowing the vegetation to establish and the PP net to intertwine with the vegetations rootzone creating a stronger rootzone. Typically supplied in standard roll sizes of 2m x 50m. 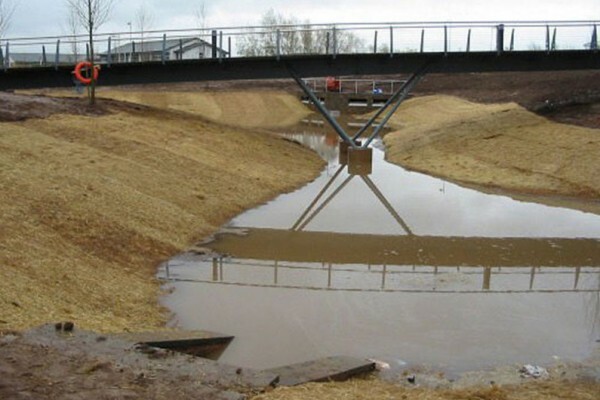 Suited for drainage ditches, shore and bank protection, areas with rising and falling water levels. 350gsm, PP net (19mm X 19mm) Both Sides stitched with Black PP thread. Techmat CB350(P20) consists of 100 % untreated coir (approximately 350gsm) stitched between a 19mm x 19mm Polypropylene (PP) netting. With PP thread used for the stitching. Techmat CB350(P20) is typically used on Slopes 1:1.5 ;1:1 or steeper. Offering 100% soil coverage when laid in accordance with the installation guidelines, as opposed the to the Techmat CN range of coir nets detailed below. The coir will break down over a period of time allowing the vegetation to establish and the PP net to intertwine with the vegetations rootzone creating a stronger rootzone. 350gsm, Top And Bottom Jute Net with Cotton thread. Techmat CB350J consists of 100 % untreated coir (approximately 350gsm) stitched between a jute netting with a cotton thread used for the stitching. The Techmat CB350J offers 100% soil coverage when laid in accordance with the installation guidelines. Due to being made of completely natural fibres the whole blanket will break down within a 6 – 12 month period, offering organic materials to the soil allowing the vegetation to establish. Techmat CB350J is typically used on Slopes 1:1.5 ;1:1 or steeper. Supplied in standard roll sizes of 2.4m x 50m. 355 – 370gsm, Black PP net (19×19) top and bottom with middle wave net (12×12) stitched by Black Thread. Techmat CB3D is a 100 % coir blanket reinforced on upper side with a corrugated Polypropylene mesh. The Techmat CB3D coir blanket provides immediate erosion and evaporation protection. root growth of the new vegetation. Offering 100% soil coverage when laid in accordance with the installation guidelines as opposed the to the Techmat CN range of coir nets detailed below. zone offering reinforcement to the area permanently. Supplied in standard roll sizes of 2m x 30m. Techmat CN400 is 100 % coir twisted yarn weighing 400 g/m² weaved into a net matting. CN400 has a durability of approx. 2 – 4 years depending on conditions (temperatures, moisture, soils, etc.) and will completely biodegrade. Typically used on slopes of 1:3 – 1:2. Techmat CN700 is 100 % coir twisted yarn weighing 700 g/m² weaved into a net matting. CN700 has a durability of approx. 3 – 5 years depending on conditions (temperatures, moisture, soils, etc.) and will completely biodegrade. Typically used on slopes of 1:2 – 1:1. Techmat type P is a range of non-biodegradable erosion control mats manufactured from randomly oriented monofilament polypropylene. Suitable for a range of applications where longer design life (more than one or two seasons) is desirable. When correctly pinned in place and filled with topsoil Techmat type P provides excellent intimate contact with the underlying soil thereby encouraging growth through the mat. 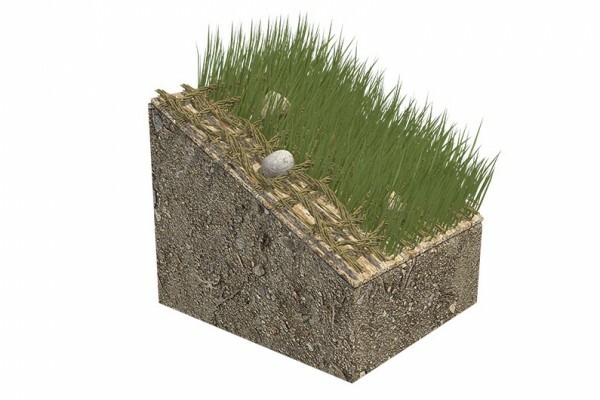 As the vegetation establishes, the roots become entwined within and through the structure of the Techmat type P thereby helping to secure the vegetation and inhibit erosion of the underlying soil.